Why hasn't anyone considered having Kevin Costner and Woody Harrelson in a movie before this? The Highwaymen project was started in 2005 with the idea of putting Robert Redford and Paul Newman as the aging Texas Rangers. It wasn't until Netflix was in charge the the film directed by John Lee Hancock and written by John Fusco started shooting in March 2018. 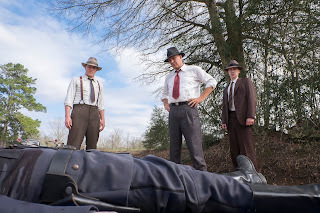 Louisiana and other historical sites including the road where the final shootout took place and the art direction, costumes and period cars all added to authenticity of 1934. Frank Hamer (Kevin Costner) was the archetypal Texas Ranger living a quiet life with his independently wealthy wide Gladys (Kim Dickens). The first female Governor of TX, Miriam "Ma" Ferguson (Kathy Bates) had disbanded the Texas Rangers in favor of the State Police and the FBI. 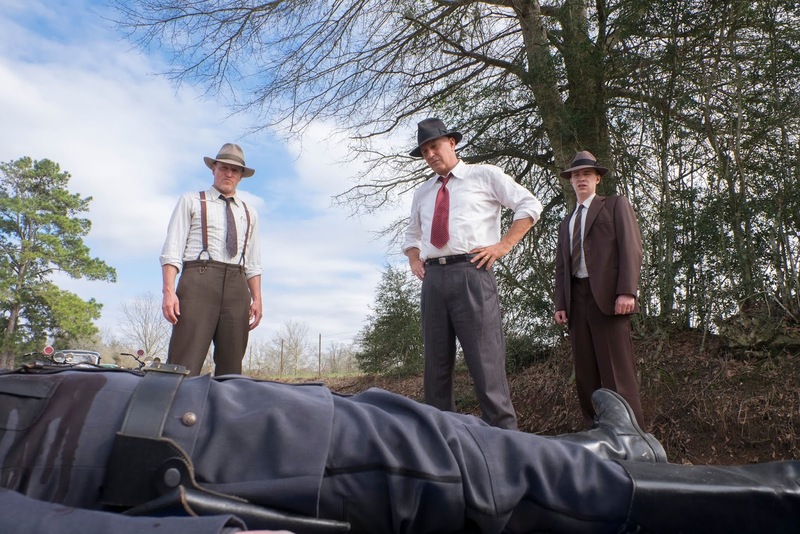 However the crime spree of Bonnie and Clyde has left a trail of bank robberies and murders and she desperately wants them stopped. Lee Simmons (John Carroll Lynch), the prison warden, suggests getting the ex-Rangers involved since they had a reputation of not being excellent trackers and are not afraid of killing the bad guys. "Ma" agrees, but keeps her Texas State police and FBI to keep a close eye on their activities. Hamer enlists his old partner Maney Gault (Woody Harrelson) if somewhat reluctantly. Both men are much older than their heyday as Rangers. Their shooting skills and abilities to chase suspects are greatly diminished. But their skills on running down information and making educated guesses on tracking the Bartlett gang are still sharp. Even the police and FBI are a step behind their conclusions even with their new tech of wire tapping at their disposal. Costner and Harrelson are great as cranky old guys who bicker and annoy each other. Bonnie and Clyde became social media stars of the 30's. They were insanely popular with robbing banks which at the time were the source of all that was bad in the 30's economy. Women would parrot the fashion of Bonnie with her slim dresses and jaunty berets. When they drove through towns, fans would surround their cars and adulation. They ignored the fact that the duo were also stone cold killers. Arthur Penn's glamorized version of Bonnie and Clyde is probably what everyone considers the ultimate story of the infamous bandits. The Highwaymen tells the cold hard facts of the other side of the story. Not as flashy but the real life Hamer and Gault's efforts were able to get the Texas Rangers back installed in the state. Now all we need is to see Costner and Harrelson in something more worthy of their chemistry. Opens on NetFlix March 29.